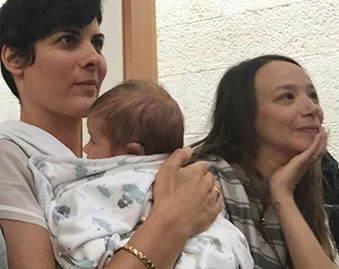 On Monday, Ravit Zur and her partner Orly will stand before the Israeli Supreme Court demanding LGBTQ rights for their family, and other LGBTQ families. This is her moving Facebook post, that went viral, about her journey from first hearing the word ‘lesbian’ at age 7, to fighting for LGBTQ rights at the Supreme Court as an adult. I am 7 years old and I hear this word for the first time. It’s not a word that was thrown into the air commonly in the small neighborhood of Afula. There was no one around me to ask what that meant. She could say “a girl of divorced parents” or say about my mother that she was ‘four eyed.’ But she chose ‘lesbian.’ What is lesbian? My mother’s love relationships were a taboo not to be talked about. I went to ask her. It turned out that even at home it was a dirty word. She grabbed me by the arm and took me down the street to Adi’s house. She asked Adi’s mother to give her daughter some manners. 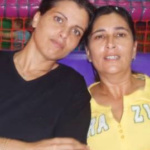 Adi’s mother explained to her daughter and to me: “She can’t be a lesbian, she has children.” An immortal logic that would burn in my soul and accompany me throughout childhood and adolescence. My mother can’t be a lesbian because she has children, what a relief. Meanwhile, in our home, they would come in pairs. From all corners of the country – like in Noah’s Ark. Beautiful, brave women. They were unusual – the way they dressed, the way their hair was cut, their body posture. They were a display of depth and boldness and versatility and colorfulness (and fanny pack, lots and lots of fanny packs). They were different from my friends’ mothers. And I loved them dearly. I would do plays for them and they would spoil me with good words of amazement. I knew all their stories of love and breakups. I got to see them fall in love and break up and get up on their feet again. I got to hear them cry and laugh. Wow, how much they laughed. In loud voices, they laughed. 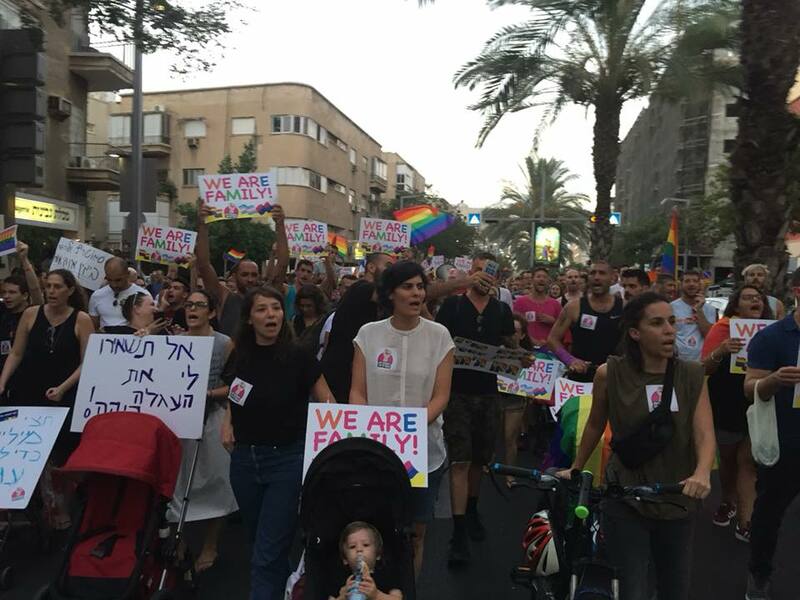 They may have had to meet only in private homes and some remained married to men or remained trapped in the ‘holy life’ in Bnei Brak – but how happy they were with each other. I saw them get married to men just so their parents would not die of grief, and have children with men who they didn’t like just because they wanted children. I saw them leave the country and come back. I saw them all – Ashkenazi and Mizrahi, secular and religious, Israeli and foreign. Their liberation and courage made them so beautiful in my eyes, and I was a child, in Afula. My mother has experience. We’ve gone through too many boycotts. This time she is determined to promise her kid a different childhood. To my new friends, my boyfriends, the neighbors, the schoolteachers, the grocery store workers – I practiced these same words on all of them. Sisters and good friends, that’s what they are. When you repeat something so many times – you begin to believe in it. Almost. I am 27 and a half, in love. After many handsome and good guys, this time it’s a girl. And it feels as natural as walking. Feels like going to tell my mother. So I tell. But her face falls. She looks up at me, startled. She, who was cursed and slandered in the street because she lived with women, yells that I’m her daughter, that she knows me, that I’m not lesbian, I’m by no means lesbian. I see her eyes fill with anger and pain and guilt. About her life and mine. Before her eyes was the life I’ve been through because of her. She’s afraid of what I’m headed towards. She is afraid of what my children will go through. I want her to understand that the 1980s are so over, and we are no longer in Afula. Among the guests: my mother. Proud. For two months she scattered invitations and told friends about her daughter’s upcoming marriage and her heart’s choice. It’s been 30 years since I was a child with attention addiction who bothered with plays, and here they come again. In pairs. My guests of honor. With glittering eyes, they see how I, Dalia’s daughter, stand with a woman under the Chuppah – and realize their own dreams. On Monday Orly and I will stand together in the High Court of Justice. Our joint son will be there with us, hand in hand in hand. We’re going to say to three Supreme Court judges that now everybody knows that those dark days are over. Secret meetings, curses on the street, double lives, lack of rights-it all passed a long time ago. There are ministers, MKs, rabbis and government officials who are doing everything they can to keep us in the dark. We will not agree to that. We have enough light to clarify this. We live together. We have children. We raise them and tell the whole world about it. With pride. [Our son] Mori knows from the age of zero that he has two mothers. He tells everyone that he has Mommy Toosh and Mommy Orly. On Monday we will demand recognition for our family unit, without any pleas or favors. 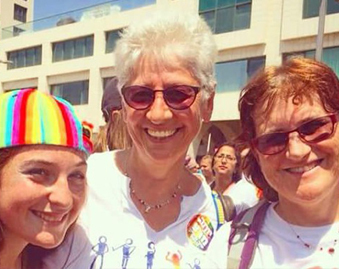 Because the son of these lesbians is the sweetest and happiest boy – and we’ll make sure nothing hurts that. I dedicate this post to that wonderful group of women (and especially to Ricky, my sweetheart) who taught me what courage is. And most importantly, to my dear mother, who today I understand how much courage and strength she needed to live her life exactly as she wanted. Come with us on Monday. If not for me – so for them.